At Collis Primary School, we strive to cultivate a real enjoyment of music and aim to deliver high quality music teaching, supporting and encouraging all children to achieve their full potential. Through Music at Collis, we aim to: foster a love and understanding of music through active involvement in listening, appraising, composing and performing; enable children’s personal expression, reflection and emotional development through music making, both individually and together; and promote the understanding and appreciation of the richness and diversity of world cultures, styles, times and periods. 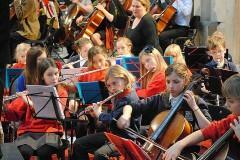 Collis holds music in high regard and the range of additional musical opportunities in which the pupils can be involved reflects this: a range of peripatetic music tuition is on offer, provided by the Richmond Music Trust; all children take part in whole school singing; and children may have the opportunity to attend a musical performance or workshop at school or externally. 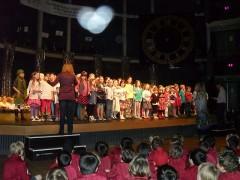 We also encourage opportunities to perform to the school and the wider community, for example the Year 3 trip to Elleray Hall and the Years 5 and 6 carol concert, assemblies, productions and concerts all provide important opportunities for the children to perform, share and enjoy music through singing, playing and listening to music. Children are provided with the opportunity to partake in school-based extra-curricular musical clubs before school or at lunchtime, including Year 2 Choir, Lower School Choir, Upper School Choir and Orchestra, run by members of staff and parents. 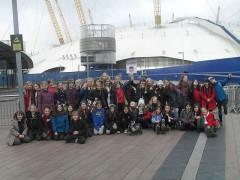 Extra-curricular music trips are also offered, giving children the opportunity to perform alongside the wider community, for example, at the local Singing Festival, the annual Instrumental Day and the O2 arena. Opportunities for cross-curricular links are also taken, wherever possible, to link music with other subject areas and learning themes.